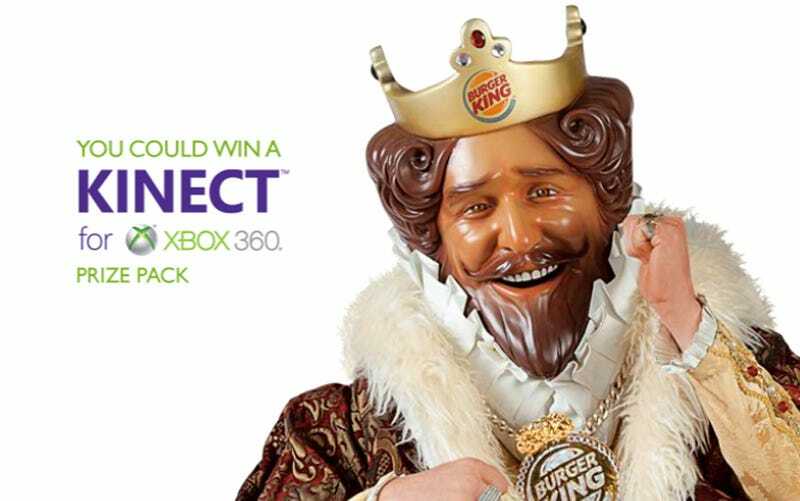 Burger King is giving away a 4GB Xbox 360 Kinect bundle every fifteen minutes between now and November 28, and all you have to do is order a Whopper extra value meal. Is it worth it? It's Kinect release week, and Microsoft has teamed up with Burger King to give customers a shot at winning Xbox 360 Kinect prize packs all month long. The pack contains a 4GB Xbox 360 consoles, the Kinect sensor, Kinect Adventures and Kinect Sports. All you have to do is supply a 250GB hard drive and you'll have a worthwhile console on your hands. To win, visit Burger King and purchase a Whopper value meal. the sandwich wrapper, drink, and fry container will have codes for you to text to a special number in order to be entered. After getting the numbers and texting them in, you can safely through the food away. "We believe Kinect is going to be one of the hottest gifts this holiday season, and for the cost of a Whopper Value Meal, our guests will have a shot at getting their hands on it," said Mike Kappitt, chief marketing officer, North America, Burger King Corp. "With a winner every 15 minutes throughout the month of November, there's no better way to kick start your holiday shopping than with a Prize Pack and the fresh and juicy Whopper sandwich." I can think of several better ways to kick start my holiday shopping, none of which use the phrase "juicy Whopper sandwich." Check out the contest's official website for pictures of the creepy king doing creepy things.